With the grass starting to green up, the Walker Mower is ready to go to work preparing lawns and landscapes for the growing season. With seasonal attachments and implements, and a wide variety of mowing decks, the Walker Mower makes springtime work fast and easy and gives beautiful results. A Beautiful Cut: Does It Really Matter? June 2015 Productivity Challenge Winner! When it’s Time to Mow, You Mow! Flowers are her calling card! 'NO' is not in our vocabulary! How do you handle debris? Do you operate with a contract? "I Have My Own Little Business Going"
Homeowner puts Walker to Work at "Serenity Acres"
Is financing a mower for you? Looking for a used mower? 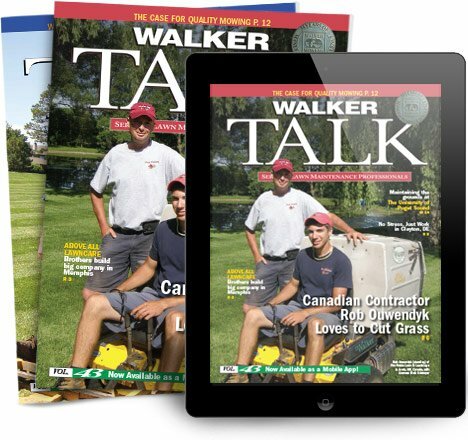 "You are what you think you are"
"A Walker is more than a mower, it's my way of life"
D & R Offers Customers "Complete Care"